Available on IOS & Android, download the app and start winning now!! WINBOX is a REAL DEMAND ANNOUNCEMENT BOARD, with only true purchase intention ads, organised in such a way, that in just three clicks you can upload your add about what you need if you are a future buyer, or you can see what people NEED, if you are a possible seller or service provider. WINBOX is a direct contact platform, WITHOUT INTERMEDIARIES, in which buyers and sellers reach beneficial agreements for both parties. On the demand side, future buyers (Needers) log in and place their “real demand” ads for the products and services they need or are looking for, and the price they would pay for them. On the supplier’s side, potential sellers (Getters) will browse the app to see what is being demanded, therefore sellers will try to cover those needs better than anyone else in order to close the sale and earn the money. The idea arises to solve THE CURRENT PROBLEM OF EXCESS OF INFORMATION ON THE INTERNET, there are so many products on offer that we waste too much time looking for what we want to buy. 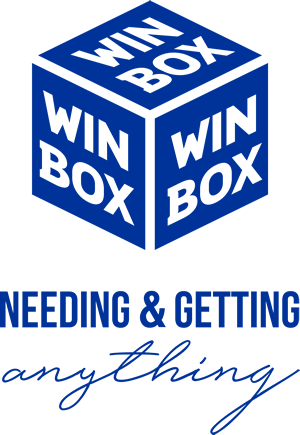 In WINBOX the buyer only puts his ad with what he needs and what he wants to pay for, and then he will choose among the offers received from the possible sellers. 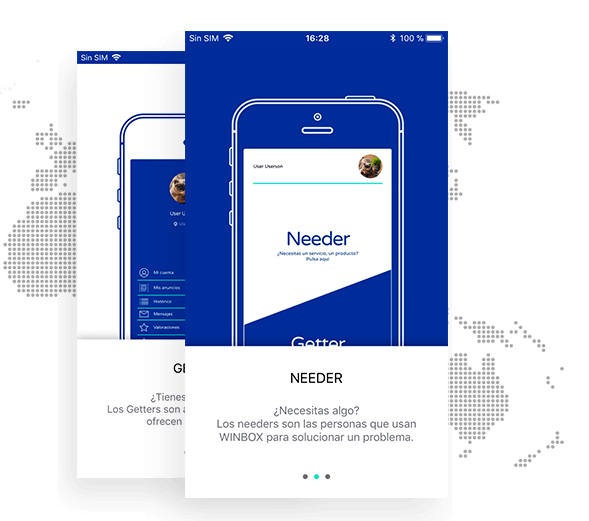 The Needers will use WINBOX to get what they want, at a better price and with less effort, and the Getters will use WINBOX to earn money. It is a Win-Win solution. This is our best publicity. In WINBOX, the sellers are the one who should strive to cover these “real needs” better than others, so that their offer is chosen by the buyer, and thus take the deal and money. If for your personal circumstances, you can offer something at a zero marginal cost or very low one, you will enter in WINBOX, then see if someone is demanding it, and finally you can offer it directly to the buyer, without intermediaries and you will earn easy money with the sale. In case that you do not apply any filter, in WINBOX you will only get the ads being demanded near you, so you can get them and earn money. Upload some photos of what you need or are looking for if you are a buyer, or what you offer them if you are a seller. The buyer can chat with each of the sellers who send the offers in response to your ad to resolve their doubts, before choosing which of them to reach an agreement. Five days after each agreement is closed, the app will send a notice to the buyer and to the seller, to rate the other party. In WINBOX the “reputation” will be very important. At same offers you will choose the seller who has the best ratings from previous buyers. In this manner, your ads will arrive a little earlier to the sellers or GETTERS, that you already know and you like how they work. Select yours and download it. A world of opportunities awaits you. Do you want to contribute something? People who pay get what they want without effort, and those who charge could even live on this, to satisfy demands by charging for it. Just as there are now Youtubers, Instagramers and Influencers, when the use of WINBOX is extended, many people could be “Getter” to make a living. I am an Au Pair, I enter WINBOX every day to see if they demand my services, but also as some families already have me as “CONTACT LINKED” their ads come a little earlier, and I get a lot of recurring jobs. WINBOX is awesome !! It was super easy, I needed a photographer for the communion of my daughter, but I had a very tight budget, I uploaded it to WINBOX, and immediately I received three offers, we chatted and closed it with a photographer that was great, totally recommendable!!! I’ve got a lot of work through WINBOX, I just filter the ads that need a painter, and I answer them, that was easy!!! I wanted to buy a VESPA, I uploaded it to WINBOX, (model, and price I could pay), and the following week I was flying between traffic with my bike!!! Jaime B. Professor of E.S.O. I am a Getter in WINBOX, I use it every day to see what they need near me, if I get it I earn good money. And if I cannot do it, I use my contacts to get it.